Last week ICCHS PhD researcher Rebecca Farley joined an interdisciplinary group of academics, artists and architects presenting at Edinburgh University’s ‘Moving Mountains’ conference. ‘Moving Mountains – Studies in Place, Society and Cultural Representation’ was organised jointly by the University of Edinburgh Art History department and the School of Architecture and Landscape Architecture. Taking place over three days the conference was delivered as an open discussion on the impact of mountains and mountain landscapes on visual art, architecture and wider culture and society. Keynote speakers included Veronica della Dora, Professor of Human Geography at Royal Holloway University of London and Tim Ingold, Professor of Social Anthropology at the University of Aberdeen and Professor Eamonn O’Carragain, from University College, Cork. 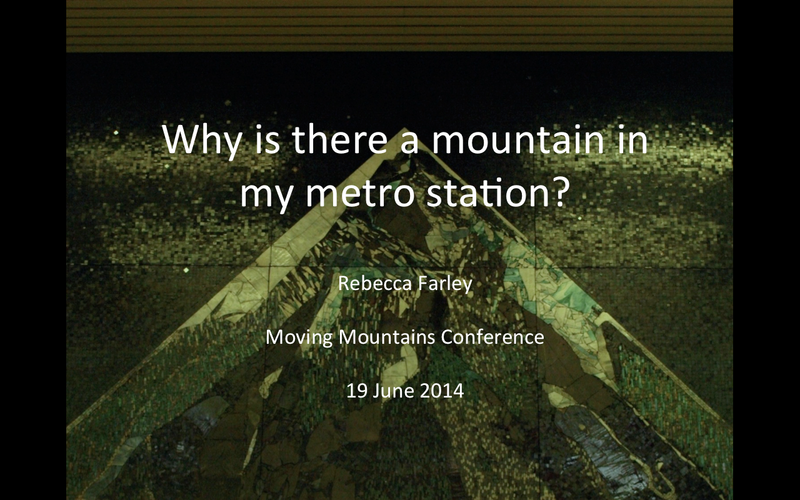 Rebecca’s presentation, ‘Why is there a mountain in my metro station?’ was a contribution to the panel looking at the relationships between art, architectural space and the concept of ‘the mountain’. Focusing on one of the case study public artworks that she is investigating as part of her PhD research the paper told the story of three mountain-scape mosaics by the British artist Keith Grant commissioned by Nexus for Gateshead Metro Station in the early 1980s. It explored how this triptych of artworks has been incorporated into the architectural, visual, material and perceptual grain of everyday city space. Visit the ‘Moving Mountains’ website for further information about the conference including all the presentation abstracts and speaker biographies. Visit Rebecca’s academia.edu profile for more information about Rebecca and details of her PhD research project. The ICCHS PGR conference look place last week, and despite the lack of coffee until late in the afternoon due to the disruption caused by a ‘suspicious substances’ alert at the University, it was a real success. It was great to get together as a department to discuss and share ideas on our research and, for me, one of the key things that came out of the conference was an appreciation for just how ‘alive’ the research emerging from the PhD community here is. 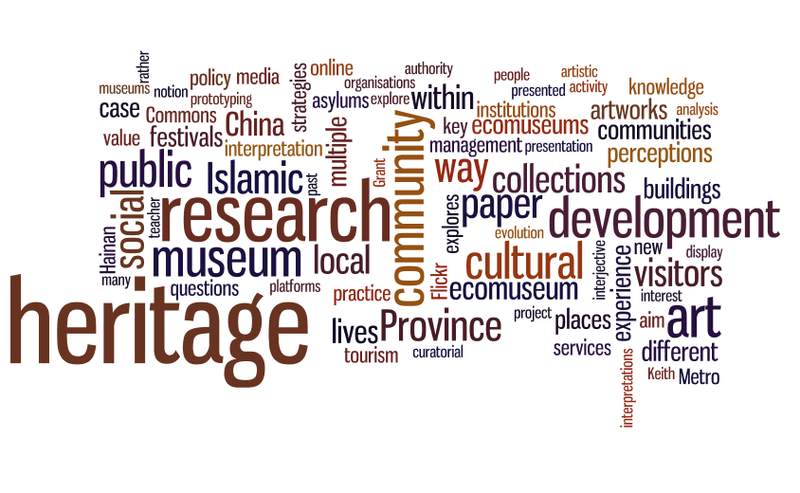 We are all pursuing diverse projects, working away at answering our own research questions, but we are also collectively contributing to a discussion on the big questions relating to the role of museums and heritage in contemporary society. If there is one thing that PhD students are good at, it is asking questions! We started the day with my own presentation, in which I spoke about the increasing involvement of community organisations in the local authority museums sector and the role of the policy environment in influencing this. In Session 2, Niki Black presented her work on the impact of differing interpretations of heritage on small-scale cultural festivals. Next, Bronwen Colquhoun shared the key findings of her research project that investigates how the image-sharing website, Flickr The Commons, functions as a community of interest, and the extent to which the application generates knowledge and meaning around historic photographic collections. Finally, Carolyn Gibbeson explored the varied and different interpretations of the mental asylum from the viewpoint of those who built them, former patients, urban explorers, property developers and the heritage sector. After lunch, and kicking off Session 3, Rebecca Farley explored the significance of Keith Grant’s Gateshead Metro mosaics and the response of Metro passengers’ to their everyday encounters with the artwork. Next, Gabriella Arrigoni, a practice based researcher from Culture Lab, talked about the concept of the prototype as aesthetic paradigm of current artistic production, and the related notion of the lab as a site for testing. Following this, Muhammad Ilmam bin Tharazi, presented his overall research on the representation of Islamic art since 9/11 and the recent transformations of the Islamic galleries at major national institutions such as the V&A. In the final session of the day, the focus turned to China. To begin, Katharina Massing presented some of the key results of her PhD project, which critically examines the current ecomuseum development in Hainan Province, China. To close, Yong Zhao presented the results of her quantitative and qualitative data analysis of visitors to the Historic City of Xi’an, China, to argue for the importance of good interpretative strategies to enhance visitor satisfaction. 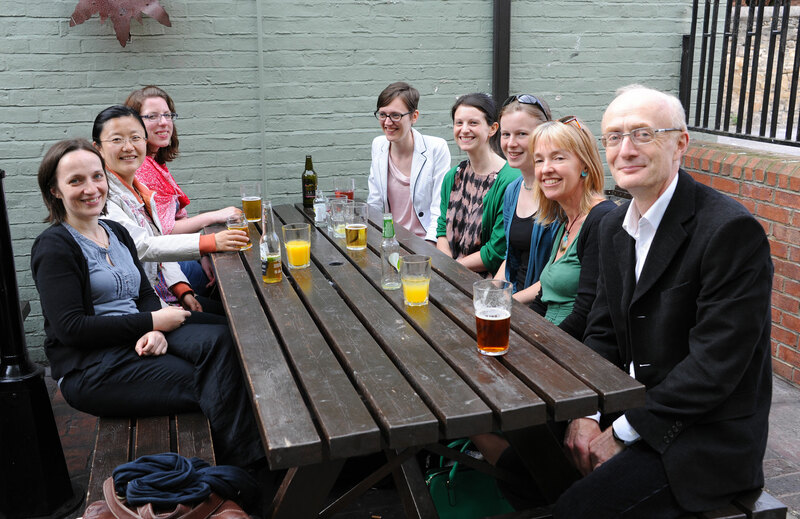 After a full day of excellent presentations and discussion, we headed to the pub for a much needed drink. Thank you to all of the presenters for talking the time to prepare their papers and to the staff in the department for supporting the conference – especially Aron and Areti for capturing our best concentration faces (available on ICCHS Facebook page!) and Susannah (and PGR alumni Tori Park) for sharing their experiences of post-PhD life and opportunities! You can download the full conference programme including all the presentation abstracts here. ‘Public Participation in Archaeology’, book number 15 in the Heritage Matters series has just been published. This volume is edited by Dr Suzie Thomas (Lecturer in Museology at the University of Helsinki) and Dr Joanne Lea (an educator with the Trillium Lakelands District School Board in Ontario, Canada). Public archaeology has many facets, especially the ways in which it is understood, practised and facilitated. In some places it is unknown, in some it is actively discouraged; in others it has been embraced fully and is considered normal practice, appearing in the form of ‘community archaeology’, active school and college programmes, rethinking museum strategies, and the encouragement of on-site visits and demonstrations during archaeological fieldwork. However, in a difficult economic climate public archaeology is at risk as funding cuts demand changes in priorities for heritage organisations and local and national governments, resulting in the loss of community-based archaeological and heritage projects. This volume examines public archaeology internationally, exploring the factors which are currently affecting how it is practised. Questions of how different publics and communities engage with their archaeological heritage are discussed, using a selection of international case studies described by experienced practitioners and theorists. Divided into sections dealing with international models, archaeology and education, archaeology and tourism, and site management and conservation, this book presents a contemporary snapshot of public participation in archaeology which will be of relevance for students, academics, participants and practitioners within the fields of archaeology, heritage and museum management. Details of other books in the Heritage Matters series can be found on the ICCHS Research and Engagement pages. These publications can be purchased through Boydell and Brewer. The latest volume (book number 14) in the Heritage Matters series has just been published. ‘Conserving and Managing Ancient Monuments’ is written by Dr Keith Emerick, a practising heritage manager of 25 years’ experience and a Research Associate at the University of York. The origins and use of conservation principles and practice from the nineteenth century to the present day are charted in this volume. Written from the perspective of a practitioner, it examines the manner in which a single, dominant mode of conservation, which held sway for many decades, is now coming under pressure from a different and more democratic heritage management practice, favouring diversity, inclusion and difference. The author blends case studies from Ireland, Cyprus and England with examples from current practice, community heritage initiatives and political policy, highlighting the development and use of international charters and conventions. Central to the main argument of the book is that the sacred cows of conservation – antiquity, fabric and authenticity – have outlived their usefulness and need to be rethought. Display from the 1960s at the South African Cultural History Museum. The South African Cultural History Museum (SACHM) was opened in Cape Town on 6 April 1966. Then known as Van Riebeeck’s Day, this date carried deep symbolic significance in the Afrikaner psyche wherein Van Riebeeck, who was the first colonial governor of the Dutch settlement at the Cape, was seen as the founding father of the white South African nation. It has already been argued that during the 1950s and 1960s the National Party and Afrikaner Broederbond supporting ideologues increasingly dominated the South African Museum (SAM) Board that enabled and led to the creation of the SACHM as an offshoot of the SAM (Mazel 2013). 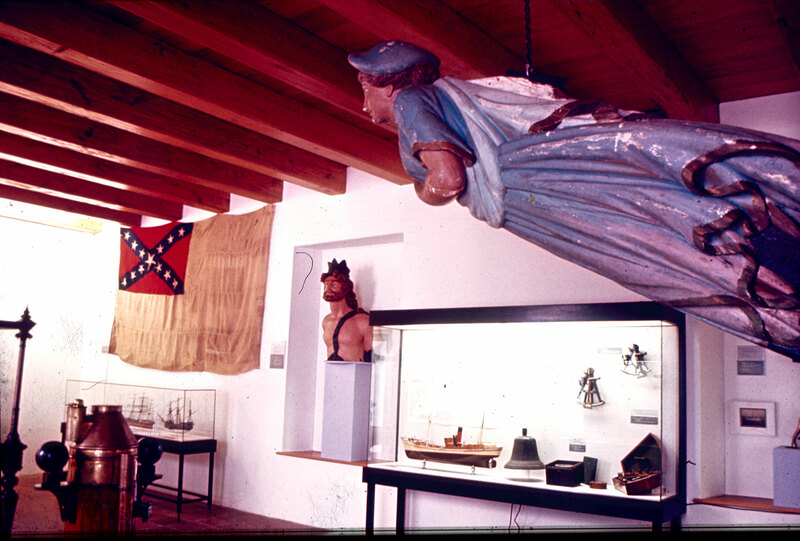 Furthermore, it is believed that their aspirations changed from initially the display of cultural history material, within the auspices of the SAM, into the establishment an independent museum committed to the presentation and housing of white South African and European material and history. Acknowledging these perspectives, this seminar paper will investigate (i) the messages conveyed by the SACHM exhibits when it was opened to the public on Van Riebeeck’s Day in 1966 and (ii) the processes leading to the creation of the displays. All welcome. No need to book. Please just come along!